You always know that chavistas are in trouble when they go back to the private TV stations, namely Globovision. I do not know how much it helped them in the past but I know that they only visit when they need badly to put their message out. This election is no exception. 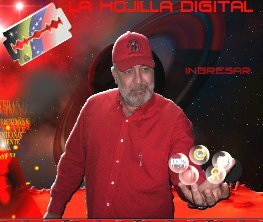 Monday night the late talk show of “Buenas Noches” saw the visit of Calixto Ortega, Assembly Man for Zulia state and one of the hatchets of chavismo when a debate of ideas is required (that is, defining debate of ideas as anything more palatable than a shouting match). Really, Calixto Ortega was his usual self pompous roundness, though perhaps with a tad stronger touch of bitterness. As if he could not believe that once again he must face Globovision. Calixto is the kind of chavista pseudo democrat that loves to have an opposition in parliament as long as this one is never more than 10% of the seats and thus easily shut up. Though I start to suspect, form his impotence Monday night, that he has learned to enjoy a parliament where the opposition can never express an opinion. Just a few snippets will illustrate how useless debating chavismo has become and how the electoral campaign is now a matter of killing the opposition once and for all for chavismo. In this Calixto was particularly offensive. One heated exchange was the dismal Venezuelan performance at the UN. 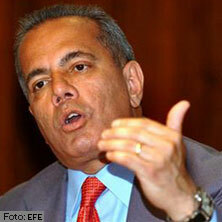 Calixto said that all Venezuelans that do not support the actions of Chavez in gaining an UN seat are traitors. That is right, traitors, words repeated when the journalist astounded demanded a restating. Apparently according to Calixto you may dissent with Chavez about wanting to get a seat at the UN, but if Chavez decided to get a seat (which of course he did not consult with the opposition, not even his party so you could never express your dissent) then all Venezuelans must make due effort to help Chavez get it. Otherwise they are traitors. In other words yours truly was declared Monday night officially to be a traitor to Venezuela. Never mind Calixto’s own betrayal of ethics, morality, basic intelligence and rationality. Other gems are not to be missed. He bemoaned that he has been subjected to 15 years of Rosales rules and thus he knows very well that Zulia will vote for Chavez. How Rosales could be reelected for those many years does not seem to be an anguishing question for Calixto. But Calixto aggravated his case by saying that Chavez has ruled for only 8 years, more than half of them cut out because of political unrest. And then he goes back to the 15 yeas of Rosales in Zulia. I cannot find, for the life of me, a clearer example of chavista intellectual dishonesty (or is that dysfunctionality?). Calixto is ready for the totalitarian state that Chavez is promising us. He will be the perfect Zulia Kommissar (or is that Gauleiter? Sometimes I get confused). He also said that chavistas would come more often to Globovision if they were allowed to speak the way he was speaking. The journalists promptly reported that they were permanently invited but they never came. They did fail though in asking how come so many oppo leaders could not make it to VTV. And of course he defended Chavez refusal to debate with the most outrageous arguments. For example we were told (lectured?) that Chavez is debating constantly with the people, that it is the only debate that matters. I would suggest to Calixto to tell us how often in 4 hours of Alo Presidente Chavez actually debates anyone, and I mean anyone, people, minister, journalist, whatever. Other allusions as to the lack of intelligence of Rosales or to his lack of representativity were hurled. I liked the one that since Chavez has already the backing of 70% of the population then he does not need to account for anything, that everyone was clear on the issues. And more but by then my feeble mind reeled. What can I say? The most worrisome thing in the whole sad spectacle is that the Calixto of last night was not the Calixto of 2-3 years ago (which was not much to begin with). He has become a tired and impatient Calixto that simply put has no interest anymore for democracy, debate, discussion, or even the patience to listen to the other side politely before doing as he pleases anyway. The deterioration chavismo thin democratic veneer keeps apace. If Calixto has reached this stage I wonder where are the others such as Iris, Cilia or Lara. This provocative title comes because so many pundits are peering through the Crystal Ball to see how strong is Chavez advancing or how quickly he is retrograding. I say neither because I remember the words of former Speaker O’Neill (who probably got them from somewhere else) “all politics are local”. But it gives me the opportunity to indulge in writing about politics elsewhere, to refresh from the Venezuelan curse. Of all the recent elections (since Peru anyway) the only one where there has been a clear Chavez effect is Ecuador. There we had a candidate, Correa, who dared to run without a political party because he said that he did not need one since the first thing he would do reaching power would be to call for a constituent assembly, à la Chavez. Well, it did not work quite well. After polls which for a while let folks expect that he might be elected on the first round, on election night the surprise was that he was second, and at 22% at that. Apparently Ecuadorians do not think that yet a new constitution will solve the problems. They certainly did not solve Venezuelan ones. To bring peace all parties need to sit down, talk and reach compromises. What happened also is that the rather unpalatable banana magnate, Noboa, tied Correa tightly to Chavez while he was buying votes here and there. Correa foolishly thought that in Ecuador his stay at Chavez ranch in Barinas would pay off, and that lashing folks with his belt would show abilities to run a country. It did not. And recent polls suggest that he will not make it on the second round and that after two previous tries Noboa will get the seat he wants so much, and a possible coalition in Ecuador’s Congress which could bring some peace to this much troubled nation. Not that I am particularly optimistic with Noboa, but at this point in Ecuador, anything that promises a stable president for at least 2 years seems an improvement. Thus, in spite of all the help that Chavez sent Ecuador, all the maneuvering around prickly Palacios, Chavez will risk to have wasted his money on Correa without even getting a few seats in Ecuador congress. And of course Noboa will quickly side with Colombia and Peru to refurbish the Andean Community, negotiate free trade agreements and push forward the Andean block while Mercosur keeps pondering the imponderable. Add to this we see that Chile is debating a return to the Andean Community, and that Bolivia is in no rush to leave it, and we can only wonder where does that leave Chavez. Unfortunately for him he is not getting good news from Brazil. 1) Chavez thinks he is the leader of Latin America when puny Venezuela is barely 13 % of Brazilian population, and even less of Brazil industrial might. 2) Chavez also wants to edge out Lula form some well known leftist forums located, imagine that, in some Brazilian city. 4) And last but not least, Chavez prodded his protégé in Bolivia to nationalize considerable Brazilian interests in Bolivia. Lula who has been planning his reelection for a long time was not amused at all. Already a cold was detectable between the two, and the incessant trips of Chavez to Brazil ceased. Well, Chavez was campaigning for the UN, so maybe he had less time. But the problem was clear, Chavez actions were stirring trouble on the left of Lula as well as on his right. Lula had to stay put because, well, he needed all the votes he could get. Now that he did get a clear 60%, things will change. See, Lula has only four years of glory left and then he must retire. Since he is far from a majority in the Brazilian Congress and he lives in a country chockfull of ambitious presidential candidates with strong provincial fiefdoms, there is no way he can change the constitution to stay forever and ever. So, what will Lula do on the foreign front? Lula is the president of a country with traditional imperial tendencies, just like the US has been. Soon the Venezuelan trouble maker will be told to shut up and let the big guys negotiate as they want. And that will be the end of Chavez internal ambitions, at least until Lula leaves office. Oh yes, as long as Chavez has a big check book and does not repress too much at home, Lula will embrace him and falter him in public. But behind closed doors Chavez will have to stay quiet. 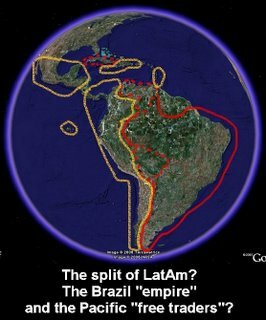 Or does anyone think that Chile sudden rapprochement to the Andean Community is something more but the attempt at creating a trading balance against Brazil? Not Mercosur, Brazil. And wait for Mexico to try to fish in these troubled waters from which Venezuela and Brazil have been busy trying to shut out and leave it as a US agent. Indeed, the time is right for a Pacific trade community of Latin American nations. Mexico, and Central America, Colombia, Peru, Ecuador and Chile are a natural trading block which has it all, oil, food, industry, free trade agreements with the US and cheap maritime transport between their main production centers. Now, in Mexico, AMLO ‘s crusade against Calderon seems to be faltering as we can see form the dismal result in AMLO own home state of Tabasco where his PRD governor candidate lost by a wide margin a state that AMLO had largely won. That is, people are getting tired of a guy that barely got a third of the vote who is trying to wreck the Mexican institutions, as deficient as those ones are already. But it is not only AMLO suffering the consequences of his misplaced pride: the result could give a chance to the historical declining PRI to recover popular initiative and become the social democratic opposition to Calderon’s PAN. Well, that would be nice but I doubt that PRI old caciques are able to understand the historical chance AMLO self destructive folly is giving them. Meanwhile Calderon will have 6 years to demonstrate that the promises of Fox are not empty and that a modern and trading Mexico can lower poverty while a divided left leaves him the field quite open for a while. Calderon should look the Andes, there are friends in need there, as much as he needs them. It cost him a fortune, but he lost all but Bolivia (and perhaps insignificant Nicaragua, the last test available for Chavez). If Chavez gets reelected, besides been reviled at the UN for needless posturing and naked ambition, he will have helped along the division of Latin America into two, a Hispanic speaking one, and a Brazilian speaking one with some states that have no choice but to associate with Brazil (though Uruguay has already started “talking trade” with the US). Between these two blocks, Chavez will be a non entity that messed its chance at leading the Andean block, and that will be instead the “tonto util” of Lula. Lula's achievements have come without the populist trappings, irresponsible fiscal policies or erosion of democracy seen in other Latin American countries -- most notably, neighboring Venezuela [my emphasis]. Brazil's often precarious finances are in better shape today than four years ago. International Monetary Fund loans have been paid off, inflation is a mere 4 percent and the country has $60 billion in foreign reserves [without the oil bonus of Venezuela!]. Poverty reduction has come about largely because of an innovative program under which the government provides poor families with a monthly cash subsidy if they meet certain requirements, such as sending their children to school and having them vaccinated [The only requirement of chavismo is that you wear a red shirt]. Poll wars have been going amok recently. Even worse, some are taking those polls very seriously without even trying to connect the dots with the political reality of Venezuela. Thus in a fit of boredom during a rainy Sunday I did pick up my Excel sheet and the results of the CNE and decided to draw an electoral map of Venezuela. The CNE numbers are the only ones we have for elections. Many think that they are fake for the Recall Election of 2004, and that the following ones are not meaningful in any way because of the raising abstention among other things. Thus to simplify my task I decided to limit myself to a comparison the numbers of the Recall Election of 2004, and those of the “Regionales” (for governors)of that same year, when already many a candidate of the opposition bit the dust because of a large abstention, which became even larger in 2005. The numbers of 2005, I concur, are meaningless for any serious electoral study unless one is interested in measuring the different components of the pro Chavez forces, something which holds no interest for me. Click on all tables to enlarge. The first thing that one should look at is how the abstention will evolve and how it will affect the vote. In this respect the main victim is Rosales, although Chavez also suffers of this phenomenon considering the near 80% abstention rate of 2005. Now the situation between October 2004 and December 2006 has changed. The opposition has now a candidate, a tam, reasons to vote for and thus the abstention numbers should drop some on its favor. Thus the fist table below which indicates which would be the possible abstention in December. Simply put, I calculated the abstention for next December as the same as for 2004 Recall Election plus one third of the difference between this one and the “regionales” one of October 2004. That is, there is still enough opposition that refuses to vote and some chavistas that prefer not to vote to punish Chavez. From Table 1 we can see that my calculation, based on the numbers given by the CNE, would yield an overall 37 % abstention which is quite in line with the results obtained since 1998 (the spread would be from 28% to 43% abstention depending on the different states, quite in norm) . Thus we can assume that no more than 10 million votes will be cast in December 2006. How will these votes be spread? The next thing I looked into was the political penalty that Chavez would pay for being 8 years in office. With a less than stellar administration (over 8 years his results are not positive enough to qualify as a great presidency, as even many chavistas are now routinely hitting the streets to protest) it is expected that at best Chavez will repeat (honestly this time) the score of 2004 when the extraordinary polarization of the country gave what one could say the historical top of Chavez. No half backed train inaugurated a few weeks before December 2006 will allow Chavez to improve this percentile score. Thus the assumption is that Chavez will lose some from 2004, but how much? 1) Column A. Decrease between the score of Chavez in August 2004 and what his candidate for governor obtained. This reflects not only regional problems that could come back to hurt Chavez, but also reflects the relative strength on his hold to office in these areas. When the percentile decrease is more than 5%, then there is a problem at the local level which could in two years bring vote loss to Chavez. Such states have their results marked with bold orange. 2) Column B. Increase in abstention between 8/2006 and 10/2006. This is what the opposition mostly lost and where it could recoup some. However since there might have been a certain chavista abstention now the boss was back in charge safely after August 15. I decided arbitrarily that abstention increase was due mostly to opposition disenchantment where the variation is more than 25%. Those states are indicated in red letter. And I have assumed that the opposition will recover more from that abstention than Chavez. 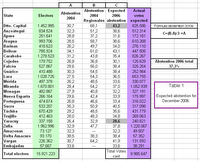 3) Column C. Now I imagined the ratio between the increase in abstention and what Chavez candidates did gain or not. That is, if all the abstention is due to the opposition withdrawing, the pro Chavez candidates for the governor house should increase its percentage by a related number. We observe in the column C of the table that it is not the case and that the ration is often way outside a -3 to +2 interval, which one would consider an anomaly. Thus where the ration is above 2 (bold blue) it is quite likely that the opposition could show a strong come back and when the ration drops below -3 (bold pink) then there is a local leadership problem that could come and hurt Chavez chances this time around. By setting this -3 to +2 or “normal” electoral behavior I introduce a slight bias in favor of Chavez. Obviously from looking at columns A, B, and C, there are some strange anomalies in the elector behavior. To interpret this, the first thing was to ignore the bold pink numbers, those reflecting a high dissociation between Chavez and his appointed governor. After all, one can argue that elector loyalty to Chavez is bigger and thus it will forgive Chavez for the bad local system, and at worst increase the abstention ranks on December 2006. Once this simplification done (but not ignored) I divided the states in 4 groups, depending how the index in A, B, and C played. In green, the states which are safe for Chavez. That is, I consider that these states are not likely to change much and Chavez should recover his 2004 result. In the other three groups I have assumed that Chavez will pay a penalty and that penalty will be either 6%, 4% or 2% loss in percentile points from the 2004 result. The test used are listed on the right bottom corner of the table. These tests are not completely applicable as I consider that Barinas, Zulia, Carabobo and Yaracuy are going through exceptional situations and I forced them into one or the other category. To explain these tests application I will chose the example of the criteria to makes Chavez lose 6%. These states are those where the opposition have abstained the most and where the Chavez candidate failed the most to benefit from that abstention. For example in the case of Caracas the abstention more than doubled from August to October 2004 (31% to 68%), and yet Bernal failed to increase by even 20% his percentile share of the vote. Clearly, Caracas, thus marked in lilac, is a prime ground for the opposition to gain a significant amount of votes, perhaps even slash a 6% in the Chavez result of 2004 considering how disastrous the quality of life Caracas has become, in particular since 2004. note again: I am discussing percentile points, not actual votes. From table 2 one can thus see that Chavez has some local problems. My speculation is just that, a speculation on how negatively Chavez could be affected, and willingly I have tried to give Chavez as much edge as possible, considering my knowledge of local politics, the voting historical pattern, etc… (For example Aragua is a very anomalous state yet it has been ruled from the left for so long that I decided to leave it as almost safe for Chavez, just taking away 2%; the abnormality in Aragua could well be due to possible tampering of votes in 2004, but I swore not to go into this today). The high water mark for Chavez? Now that I have evaluated a percentile loss from 0 to 6 % for Chavez, and the possible abstention rate, I just needed to combine the data in Table 3. For this table I have listed the possible abstention of 2006 from table 1, the penalty of 0 to 6% from table 2 which results in the expected vote, percentile, state by state (orange column). 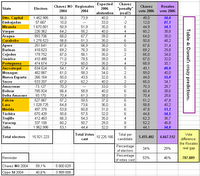 For Rosales I assumed that other candidates will get 1% and thus Rosales would get 99 minus Chavez vote (blue column). Then using the wonders of Excel formulas I calculated, based on the CNE electoral roll numbers to date and the percentile vote to be obtained what are the number of votes that each one would get, today, if elections were held. Now, of course, I am assuming that no other candidate will show any strength, and that whatever does not vote for Chavez will vote for Rosales without discussing much whether the abstention problem within the opposition is indeed solved. But the interest of this table 3 is that I believe it shows which is the maximum that Chavez can get today, and this is 5 and a half million, even less than in 2004. I really do think that chavismo is affected by an 8 years tiresome and enervating performance and his has the great risk that people might not vote for Rosales but might stay home and not go out and vote for Chavez. This is how that table must be read, the Rosales vote can be whatever it is, the Chavez vote is stuck at 5.5 million. Now, it still carries information for Rosales: the gap today is at least 1,1 million and he must recover that in the last month of campaign. A daunting but not impossible task. The good news for Rosales is that it is unlikely that Chaevz will progress much during the last month. Note: in this table I decided to regroup the states in regional order, since their relative strength of each candidate can be observed by group of states rather than by individual states. Also I indicated in bold blue the states that Rosales should be winning no matter what, again, if the CNE counts the vote as expected. Finally, since I must have some fun as I do this, I decided to calculate my own penalty, a definitely subjective proposal, getting table 4. I simply took table 3 and arbitrarily changed the abstention rate in some states and decided to increase by gut feeling, the vote loss of Chavez. The result is better for Rosales but I still have Chavez ahead, albeit closer to Rosales (0,8 million instead of 1,2). What I mean with this exercise is that even if polls in Rosales camp are better than what is coming out from suspicious pollsters, the game is not over yet. However I also added something: the states highlighted in orange are states where an additional 2 % shift toward Rosales could bring him 200 000 votes and narrow the gap to 400 K! It is thus possible, even giving a slight bias to Chavez, that Rosales can win. However one thing is certain, right now if Rosales win it will not be by much. Note: this is not my final prediction. I will update that table a few days before December 3 and then will take bets. If anyone wants me to send them my template for this particular table, write me and I will oblige. Conclusion 1: the 10 million votes slogan for Chavez is dead. At most around 10 million people will bother to vote on election day, and even if we assume the polls most favorable to Chavez, at least 30% will not vote for him. In other words Chavez will be lucky if he even gets close to 7 million votes, if all goes his way until December. No matter that Ameliach already conceded it when he already admitted the 8 million mark. Conclusion 2: there are very anomalous shifts in voting patterns between states. The way in which these shifts happened allow to suspect that any normalization of the voting pattern is more likely to favor Rosales than Chavez. That is, it will be very difficult for Chavez to get back his 2004 60% high. Unless of course the CNE helps along as it does already by being shamelessly lenient on all the campaign abuses committed by chavismo. Conclusion 3: Chavismo has a top vote, a “plafond”, which should not be more than 6 million if we consider the electoral history of the elections since 1998. It is very, very unlikely that chavismo will pass that 6 million mark. And this assuming that the past CNE results are real results. If we think that something is amiss (look at Aragua for example, something that cannot be explained with normal and historical voting patterns) then Chavez might not even reach 5 million. Conclusion 4: The best scenario for Chavez seems to be for him to win with 55% of votes cast but only 35% of the electorate. This would be a good victory if we were in a democratic regime where no major changes are planned. However this result is woefully insufficient for the massive socialization plans and constitutional changes that Chavez has announced. An opposition renewed with 40% or more of the vote will not simplify the political life of the country in the way that Chavez hopes. In other words, far from bringing peace to Venezuela, the result of December 3 might in fact bring back instability for a long, long time. Chavez set himself the trap in which he is falling. By aiming for 10 million, and then 8 and then getting 6 at most, he will turn his victory into a defeat, a self inflicted political wound which will make him a lameduck president from day one of his new term. There is one month left before the election. We will see. Venezuela's economy has always gone through a boom/burst cycle. And under chavismo it is no exception. Since all cannot be about elections, this lazy Saturday evening is a good time to review where is Venezuela's economy headed. What happened in past cycles is that there was an unusual entry of oil money (sudden increase in production and/or sudden price increase) and the governments decided that they could manage their budget, and political career, as if this sudden increase would be forever and ever. After a very few years the price of oil went down or the production dipped some and suddenly we had major devaluations and depressions, or at the very least a significant recession. We have seen two major crisis, one under Herrera Campins and one under CAP II. But lesser catastrophes of a related phenomenon did appear over time. According to the Veneconomy editorial that I post below, it seems that we are about to get into another deep crisis if some correctives are not taken soon. The only difference this time is that the price of oil will remain elevated while the financial crisis will wreck havoc with us anyway. The reason? The constant increase in government spending is not backed by an increase in non oil private investment and this will result in an "artificial" price of oil drop. That is, the price of oil will need to drop slighlty for the reckless government financial polices to come home and roost. The house of cards that Chavez built based on bond trading, corruption and hand outs to people who express their support for his regime will be blown away as if nothing. Then, well, we will see. Sometimes I think that it is all deliberate. Chavismo cronies are pulling out of the country millions and millions of dollars though bond trading as Miguel as often explained (recently here and here). Perhaps they actually want to have an economic crisis AFTER Chavez is reelected to be able to buy dirt cheap flagship companies in the hand of opposition businessman. In that case it says little of their social commitments as the crisis will create years of hardships for the workers of these industries before they can return to full production. That is, if chavismo cronies are able to make them work. Before I paste Veneconomy's editorial a little note: CADIVI has been holding several of my business importation payments. That is, some imports that have been duly and legally approved, including the required "solvencia laboral", have reached our stock room, have been sold in large part and yet CADIVI is not giving us the USD to pay our providers. One particular provider, who sells laboratory equipments forced us to get a letter of credit and all sorts of collateral guarantees before delivering the stuff because simply, they got tired of the constant CADIVI delays on the equipment and spare parts they sell. In other words, as a business manager I can live exactly, daily, what that editorial narrates. My good credit rating is useless when the government does not allow me to pay for what I buy. VenEconomy has been insisting that the price control policy combined with this government’s ever increasing public spending is unsustainable and that, sooner rather than later, the whole house of cards will collapse with serious consequences for the economy and the country. There are already several signs that the collapse is nearer than was thought. To begin with, the dollars being authorized by Cadivi are getting more and more scarce. It would seem that Cadivi underestimated the increase in the demand for foreign currency this year and, apart from that, it lacks the necessary flexibility to adapt to the present situation. Because of the lack of dollars at the official rate, businessmen are being forced to meet their urgent needs on the parallel market. This, in turn, has meant that the parallel dollar has been registering sustained increases, even going as high as Bs.3,000:$ at one point. Another factor that has influenced the foreign exchange market is the low volume of bonds denominated in dollars but that can be paid for in bolivars. What is more, according to analysts, the Southern Bond issue of $1 billion announced recently by the Finance Ministry is insufficient to revive the market. A second indicator of how near the crisis is is that there are increasing shortages of goods. During these eight years of “21st Century Communism,” Venezuela’s manufacturing industry has lost production capacity owing to the lack of investment incentives. The combination of a limited production capacity and the lack of foreign currency is increasing the scarcity of products such as sugar, milk, meat and even the “Venemobiles,” to mention just four of an ever broader range of products in short supply. According the ANSA, the National Supermarkets Association, latterly, three out of every 10 products have disappeared from the shelves. The third indicator that the debacle is imminent is the stepping up of inflation. According to the Central Bank, prices rose at an annualized rate of 29.3% in the third quarter of 2006. If this pace is maintained, we would be talking of inflation of nearly 19% by year-end and a much higher rate for 2007. The icing on this economic cake is that it looks as though oil prices will not continue to rise, the trend being rather for them to come down. The present situation has many features in common with the last year of the Jaime Lusinchi administration. That year, excessive public spending combined with strict price and exchange controls led to the collapse of the economy in the first year of Carlos Andrés Pérez’ second term in office. That year, the economy contracted by 95%, inflation was 81%, and there was a devaluation of 16%. Sadly for Venezuela, the Bolivarian government has not learned from the past. How to dissolve the National Assembly of Venezuela? This week a new issue came surprisingly to the forefront. Rosales, always finding ways to get the limelight and throw chavismo on the defensive did it beautifully by announcing that he would need a new National Assembly. Indeed, the current assembly which is 100% sycophantic Chavez is not the best way to effect national reconciliation and good government if Rosales were to be elected next December. Some chavistas were not amused and said that the National Assembly could not be dissolved, that it would be a coup. This is wrong, as I will explain below. However the anecdote is always there with chavismo. Desiree Santos is a former journalist who has become the main engineer of limitation of civil rights new laws (the gag law owes a lot to her who knows exactly how to silence her former colleagues). As a reward she has been named the vice president of that National Assembly. Well, Desiree came out rather mad against the possible dissolution. One wonders why? After all if we are to believe the Zogby poll that circulated this week, chavismo is more than certain to be reelected. So why discuss a renewal of the National Assembly? Perhaps Desiree reads other polls not as encouraging? Before discussing the legalities of the dissolution one should refocus the problem in a more constructive way. If we go back to the government surveys that give Chavez anywhere between 50 and 60%, one should already wonder what good will it be for him to keep a 100% chavista assembly. Let’s assume a favorable result of Chavez of 60% and only 40% to Rosales, the Recall Election result. Well, how can Chavez justify to the rest of the world that he is indeed a democrat when 40% of the country has NO REPRESENTATION? What serious country will sign a serious treaty with Venezuela after December 3? Indeed, in December 2005 the opposition boycotted the election and it paid the price through 2005. But if the opposition runs and gets 40%, or even only 30%, that will call on the legitimacy of the parliament. The situation will change and Chavez will find that his pleasant monochromatic assembly will quickly turn into an albatross around his neck. Of course if he plans to establish a non-democratic regime then it will not matter. Is this what Chavez wants? Thus it is my thesis that no matter who wins the election, he shall require a new National Assembly sooner than later. The question now is how to do it. It is not that difficult. The election result, whichever it will be, will require a new political system. If Chavez wins he will have to choose to remain a democrat or to move forward and establish a “no-return” socialist state which in fact will mean only that he is in charge until he dies. If Chavez decides to remain a democrat, then he will require a new assembly. It is that simple. For him that will be very easy. He can ask his deputies to resign all en masse and then new elections will be called. The opposition will not object and fresh from his presidential victory Chavez will likely manage to still get a commanding 2/3 majority but this time a legal AND a legitimate one. The situation is more complex in the case of Rosales because well, the chavista unanimity will refuse to lose the fat paycheck they are getting (not to mention the nice “tips” they get for an occasional “service” to their “constituents”). But Rosales will need to do something about it and soon: he will not be able to pass a single law as I doubt that more than 50% will defect chavismo to join him. Well, there are several ways. The first one is to call for a national pact and convince chavismo that it is in everyone’s best interest to have the National Assembly resign and go to new elections. In the 1999 constitution the election will be held to substitute a resigning or dead deputy and thus it will be elected ONLY to finish the current term, that is, less than 4 years by the time the election is held. As this is certainly not going to happen, then there are three other options. The first one, a Recall Election on Assembly members, is ruled out immediately since Rosales cannot wait for June 2008 to hold such an election. The second one will be to send the new Vice President to propose a law project in which he engages his/her responsibility. If the parliament rejects the law, then the Vice President is automatically dismissed. When this happens three times in a legislature, then the president has the right to dissolve the parliament according to article 240 which is quite clear on that (Desiree should check her own constitution). Of course this requires Rosales to name three Vice Presidents in a row as soon as possible and send them to the Assembly as fast as possible. Either the Assembly will be forced to approve the laws proposed or soon enough we could be facing new elections, as early as the third quarter of 2007. And of course there is the call for a constitutional reform. This can be done drastically if chavismo is particularly obstructionist. Calling for a constituent assembly, or more amicably by calling an amendment such as term reduction of both President and Assembly can be done according to articles 341, 342, 347, 348, not to mention the famous 350. In other words, it is possible to dissolve the Assembly and it will be very convenient no matter which side wins. Any heated argument against it can only be coming from sectors afraid of losing their privileges. Period. What would a Rosales presidency look like? After having scrutinized some of Rosales' program presented last Wednesday, and after seeing that the polls keep inching up even though Rosales is still not ahead, one can start speculating some as to how would a Rosales presidency be. It would be simplistic to imagine through time what would be the steps taken: after all Rosales will inherit the daunting prospect of the whole state machinery geared to serve the new leader of the opposition, Chavez. However it is possible to consider the “feel” that his presidency would have. We have seen already enough to suspect that Rosales will be a very different president from those we have had in the past. One thing that external observers might not be realizing is that Rosales would be the first Zuliano (maracucho) president. If memory serves me well, since independence times no maracucho has reached high office in Venezuela, this a preserve of the Andes region mostly, with a few significant figures from the Central part and an occasional Easterner or Llanero. That might seem silly to observe but it is not, because maracuchos are a breed of their own and they are mad that Venezuela development has been based on what is found under their feet and which has failed to produce wellbeing for their state while Caracas politicos have split the pie as they wished. Now Zulia has the largest chunk at the National Assembly, and probably the most vibrant state economy in spite of Colombian guerilla setting shop as your corner mafia organization. A people who has managed to strive against all handicaps imposed from Caracas will definitely imprint a new administration with quite a different way to do business. The second hallmark of a Rosales administration is that it owes nothing to Caracas establishment. That is, Rosales career has been a Zulia only career and if Rosales is indebted to anyone is to Zulia folks and Zulia campaign money givers. The Caracas funding machinery has geared only once Rosales got the presidency and they are motivated much more by getting Chavez out of the picture than by electing Rosales. Once in office, well, he will be able to stick his tongue out at the Caracas establishment. I think that this would be a tremendous change in the way of doing politics. 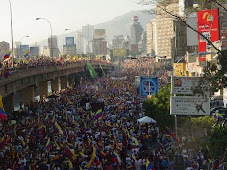 Even Chavez failed to set free form Caracas, for two reasons. His main political advisors at first where products of Caracas politics (Miquilena, Rangel to name two). Then, when he turned more and more to the army, it was often to soldiers who made career holding command or office posts in Caracas defense ministry of Fuerte Tiuna or Maracay which is after all now only a distant suburb of Caracas. And if Chavez is free of electoral debt it is only because he dips into the public treasury as needed and he forces folks getting huge contracts with the state to chip in. That could backfire once these people reach the polling station. Rosales has started his career in possibly the most difficult area of Venezuela. Sur del Lago is a hot, humid, sticky, gang land area. You cannot become a successful political leader there is you do not know how to squeeze the flesh, how to respect deals made, how to communicate constantly with the people, your constituency. Failure to do so can mean that you are promptly ejected of power, or that a “machetazo” late at night in an obscure alley would end your career. This has made Rosales a hands-on mayor and governor, one that is always worried that his policies are implemented and monitored. Granted, in Venezuelan political culture implementation and follow up are relative terms compared to what we see elsewhere, but at least it is fair to say that of all past presidents, the only one that comes close to worry about follow up were Leoni and Perez Jimenez. The interesting contrast here is that Chavez has perhaps bragged to be the most hands on president of our history but the record of mismanagement of his administration indicates that in fact he has been the most distant and disinterested president in our recent history, with the possible exception of CAP, the president to which Chavez resembles the most, even though he hates him best. Thus with Rosales we would have a new kind of management style never before experienced in Venezuela. For the first time ever we will have a president that will have extensive management experience (Zulia and Maracaibo are our most populous state and second biggest city respectively). For the first time we will have a president that is out fo reach from Caracas control, that will come with his own gang to avoid falling into the net of Caracas diverse mafias. Because make no mistake: a Rosales presidency is not a return to the past. Rosales has no need of politicos of the past, owes nothing to them, does not think like them. All of those who support Rosales and hope that they will just have to ring at Miraflores door to get a job once Rosales moves in are in for a rude awakening. Rosales is his own man and he will not take crap from anyone, be it chavista or old style opposition. Today I was driving across Carabobo and Aragua and bored I turned the radio on instead of my MP3 device. It was a good move as Rosales was announcing his program of government for the next few years, in case he manages to unseat Chavez. I was duly impressed, not by the populist content (you cannot win an election in Venezuela unless you promise lots of goodies, it is now in our genes, there is nothing we can do about unless we change our society dramatically), but by the rather convincing delivery and organization. I was left with the impression that Rosales actually means to fulfill as much as possible from his program. Once one ignores the costs of what such a program would entail, well, it is a doable program. So, since I mention the costs, let’s start there. In addition of the rather daunting bill that his social programs would represent, Rosales promised to remove sales tax from food items included in the basic food basket, and lower it on some other items. Now, this is a good move because chavismo still has us saddled with a 14% sales tax which hurts considerably lower classes when they buy clothing or household items that are essential for everyday life. In addition it promotes the considerable tax evasion that the buhonero system of street vendors represent. It is a mystery to me why in 8 years Chavez has not cleared up sales tax on basic food items (at the production level they are included and even if some items are free, their final price is affected). Another mystery is why Chavez has not set a flat 10%, easy to understand, easier to handle, on items that affect the most the pockets of the lower economical sectors of the population. Then again we had to wait until this year to finally see the minimum wage of the countryside brought up to the one from the cities, one of the worst inequities in the Venezuelan social system that chavismo was unwilling to tackle until a presidential election year finally came around. But according to Rosales, by eliminating all the subsidies that Chavez gives away to less needy countries it would enough to cover all the new social expenses that he will undertake. Again, a shrewd move because at one single stroke he avoids discussing what he will do with the Misiones, letting people deduce that their funding will be basically maintained at least for those who do bring some result (Barrio Adentro, Mercal). If you have in mind the oil rebates for London buses or for New York heating in Harlem, it is only a part of the picture: the actual target is the scandalous subsidy that keeps Castrism afloat at the expense of Venezuelan poor. People do understand that and it is clever to be able to imply a cut on Castro’s alimony without having to name him. Rosales will be able to name Castro later as needed to stress his point later. He can also name Argentina who has obscenely benefited from the largesse of the regime. The implication of these different segments of Rosales program and speech is very simple: had we been better managed, less openhanded with our money, we could have done twice as much as what Chavez has done. And Rosales does not even need to brandish the money lost to corruption and inefficiency, more arguments to stress later in the campaign. The other aspect of the program that I liked very much is the total commitment of Rosales to decentralization of the government. And on this point, as a twice elected mayor of our second biggest city, and as the twice elected governor of our most populous state, I can believe and trust that Rosales will fulfill as much as he can on this promise, the single most important item that in my opinion Venezuela needs. After eight years of continuous re-centralization to Caracas, public services in the provinces are once again frayed, infrastructure crumbles, innovation and growth lags. The Venezuelan states and town halls need to manage again a significant share of resources AND responsibilities! The current program to go directly to the neighborhood from Caracas, bypassing the governor and town hall is a hoax, a move to increase the control on the people as only communities with chavista leadership will be able to access to the rather limited credits that will be handed out as a sophisticated dole system. If those are the two details most likely to appeal to people like me in the audience, Rosales also included items that appeals to other constituencies. He made sure to give a prominent role to crime and how little the present administration cares about (again, remember how “shocked” was Chavez when a Cuban medic was shot when dozens and dozens of Venezuelan youth are assassinated every weekend without nearly a tear shed from Chavez). Rosales did also bring the institutional aspect into his program: reduction of the presidential term to 4 years with a single immediate reelection, like in most modern presidential systems. He also announced that he wanted a new National Assembly, a given if he wins as the present one will lose any legitimacy it might have pretended to have. And he wants the Central Bank to recover its autonomy, which implies a return in to accounting in Venezuela. All in all it was a good program, making sure it was about Rosales proposals and not a simple minded attack on Chavez, a satisfactory contrast with chavismo campaign which has lowered to a set of negative campaign and vague “socialist” promises to hide the true unpalatable nature of the regime sought for by Chavez and the thugs who accompany him. Still, he managed an excellent barb when he said that he would deal with street kids because he “did not want to lose his name”, in reference to a 1999 Chavez promise to change his name if street kids were not dealt with effectively. Any observer of Caracas streets, and even San Felipe one’s, will be an eyewitness that there has never been as many street kids as today. What is important to underline as a conclusion is that there is a way to effect at least a significant amount of the program, that Rosales has shown ability to fulfill electoral promises otherwise his Zulia career would not have been as successful, and that he has a vision for the country where people at the local and regional level will have a real role, away of Caracas. This last one is for me the single most important item as it will bring back democratic stability to Venezuela and it is the only way to try to solve some fo the problems that haunt Venezuela and the mess that Caracas has become. I am starting to become a believer in Rosales. In August when Teodoro left I was slightly miffed but thought that Rosales could be OK. I am seeing now that he is not only more than OK, but that he might have been all along the best candidate the opposition could have come up with: a man of the province to free us from bureaucratic tyranny from Caracas. Rosales today issued a direct challenge against Chavez, for a debate. Amusingly, but also shrewdly, he asked Fidel Castro to give Chavez permission to debate Rosales. Pantomime? Joke? No, it is really serious and it does show that Rosales keeps monitoring well the pulse of the campaign. Because the point of this whole electoral exercise it that the Venezuelan people has to chose between remaining a Western democracy or taking a one way ticket to socialist authoritarianism, in a lighter mode than Cuba perhaps, but an autocracy nevertheless where some if not many civil liberties will be restrained if not suppressed. It is all in the Chavez program for those who care enough to read about it (one party state, limits on private property, indefinite reelection, end of private education, permanent conflict with countries espousing non socialist systems, etc, etc…). Rosales is right to bring Castro finally in the campaign. People must confronted to their choices. It is important to note for the foreign observer of Venezuelan politics that Chavez has never debated with anyone, be it in Venezuela or be it in an international forum. 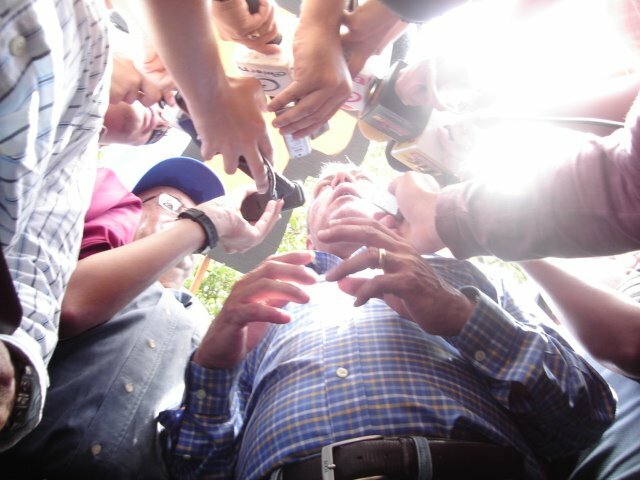 Even worse, Chavez has avoided as much as possible press conferences where journalists can ask embarrassing questions or be allowed to follow up questions if the reply is not satisfactory. And in the very rare instances where a journalist manages to corner Chavez this one does not reply the question and instead tries to discredit the said journalist by asking the unfortunate soul for which media it works and then go on his usual tirade on all the media of the world are sold out to Bush, the US, the IMF, or whomever it suits Chavez. Thus a debate is a weak point in Chavez because in Venezuela WE ALL KNOW that Chavez refuses to debate, and now even refuses to listen to anyone but Fidel. The reasons why he does so are irrelevant; the only one I would bother advance is a mechanical one: Chavez is unable to give a clear and short answer and that is a minus in a debate. On the other hand Rosales might not be a good speaker but he is good at replying in short a precise answers (when politically convenient, that is; he is a political after all). Already during recent days chavismo, sensing that the gauntlet was about to be thrown, has started to say the Chavez was too good, too important to debate Rosales. Better for the opposition: further arrogance from chavismo and Chavez can only rest him points. If you doubt it look at Lula or AMLO in Mexico who were too good to debate their opposition. The first one is today obliged to run in a second round and the first one started his descent from sublime heights to a close defeat. We shall see what happens, but as far as I can tell, it is a good move for Rosales. You can read the details of the challenge in English as Alek reported on them live. 1)More than a foot note, an extension of the above post. I was yesterday musing about polling and little did I know that today three pollsters would emit results, very contradictory at that. I think that the reports a worth a foot note as they illustrate how Rosales strategy is now showing its first results: he might not be ahead of Chavez still, but now he is definitely in a challenger position with still over a month of campaign to go. CECA optimistically declares that Rosales and Chavez are now statistically tied. Apparently this result is obtained when the polled folks get to vote on a piece of paper in a box carried by the interviewer. Maybe, but I am sure other pollsters use such artifacts to get "truer" replies. Let's just say that the value of this result is that Rosales is going up. Datanalisis is much more conservative. It has routinely been giving higher numbers of Chavez than other pollsters considered pro opposition. IT still gives good numbers for Chavez but now says that the gap has closed significantly, and that it is related to the radicalization of the Chavez speech as many people do not agree within chavismo on the new proposals. The last one is a commentary by Ocar Shemel of Hinterlaces. He is more worried about what he calls, provocatively, a loser president no matter who is elected. That is, if Rosales fails to make indents in the populist basis of Chavez, his victory would be hollow. But if Chavez wins, it would be equally hollow because he would be elected with already a see of discontent and protest around the country, and anything less than a smashing victory would handicap greatly a president already showing signs of wear and tear after 8 years in office. At any rate, Shemel says that the opportunities are in the Rosales camp and that Chavez is fighting to retain as much of his electorate as he can. No matter what these sort of contradictory results say, Rosales is on the rise and Chavez is on the defensive. As for myself, I will wait for the next Keller poll, the one to follow. I have been greatly amused by a latest propaganda piece in Aporrea (yes, I know, as elections near I am making an effort to watch and read chavista propaganda stuff). It was about the latest poll of Cifras Escenario (a totally unknown pollster for me) mixed with the much older Consultores 21 poll (a respectable pollster). The objective today is not to discuss the manipulation that Aporrea does from an already “arranged” Panorama article. They mix an older, semi reliable result with a newer result of an unknown pollster based on an “I like do not like” result about the “love” add campaign in order to make this last one more, should we say, trustworthy and meaningful, as if it were anew poll confirming the old one. No, what has attracted my attention is that chavismo wants desperately to believe that the opposition is below 25%. I suppose there is a progress of sorts: a couple of months ago chavismo refused in its poll to grant more than 15-20% to the opposition. Indeed, more than that and the vaunted 10 million votes slogan became unattainable. But now that Ameliach has accepted that it will not be more than 8 million we can let the oppo numbers increase a little bit and look ever so democratic. The point is that any political observer with a grain of savvy would know that any poll that gives the opposition less than 30% today is deeply flawed. Why? The latest life size poll we have had is the Recall Election of 2004. Then with already hundreds of thousands suddenly registered voters, amid charges of fraud that have still to be resolved, the opposition did get 40% of the votes (at least according to questionable official numbers). These were arguably the most polarized election Venezuela ever experienced. People then voted for or against Chavez and the 40% who voted against him truly, deeply disliked him. My question is: what has Chavez done since August 2004 to win over to his side a portion of these 40% electors? Was it the discriminatory Tascon list? Was it that to benefit from the Misiones you had to wear a red shirt? Was it because if you were in the government you could get one of the few built subsidized housing? Or because if you were associated with chavista business you could make enough money to buy a fancy new car? Is it because of the extraordinarily inefficient 20 all but directly appointed chavista governors we got in 2004? Is it because the trust in government increased since it is all so open, all so clear, all so audited? Or is it because we are all so delighted to have Chavez give our money away to countries that need it less than we do? It is because justice is swift an impartial as amply demonstrated in the cases of Alvaray, Anderson, Fort Mara or now La Paragua? Or could it be the unbearable crime rate of Venezuela streets which makes whatever happens in Palestine or Iraq almost look like a child’s game? Is it because your confidence in a brighter future comes to you from seeing a public employee shop at an El Cafetal supermarket with two body guards (two cars waiting for her outside with yet more body guards) and pay CASH 1.5 million bolivares the grocery bill (as seen by my mother a few days ago)? Any savvy political observer cannot believe that Chavez has significantly dented that 40% bulk. Maybe with a raising oil revenue lavishly distributed to buy votes, maybe with some unfinished but inaugurated trains he can scrap some at that 40%, but to think that the opposition today is less than 35% is as delusional as thinking that chavismo is down to 30% as some opposition TV vedettes would like us to believe. The reality is much more complex than that and we have yet to se a poll that can reflect accurately what is going on Venezuela where electoral result will be based in raw emotion on December 3. That is, if we have elections on December 3 which I am starting to doubt again. But this is another matter best left for a future post. NOTE: as an addendum activity for this pleasant Sunday after days of rain, you could do worse than watch the video dug out by Miguel, with a nice soundtrack about love while you can observe all sorts of Chavez associated violence pictures since 1992. Not to be missed. Or you can go directly to Youtube here. The Venezuela, or rather Chavez, debacle at the UN gives us great occasions to observe some variety of chavista fauna go into fits. Last I reported on how the vice president of the republic, J.V. Rangel accused the opposition of being “cipayos” (sepoys) not realizing himself that he is no better than a cipayo of Castro, as much as his boss is. Well, one could argue that his boss is even worse than a sepoy in his adoration of Castro since he does not even seem to require some of payments that a sepoy usually asks for. But I digress. As I am on the road I am catching the news late but there were two items that I did catch and are worth sharing. La Hojilla is a particularly disgusting state TV show, VTV, where some guy using a bust of Che on ther front of his desk spends up to two hours trying to discredit any news reported by private media (1). All of this at tax payer expense. In vulgarity, truth twisting, anxiety and vileness, it is difficult to find something that could match the infamy of some of the Hojillla occurrences. I turned on last night late because, well, after the dramatic week at the UN I was morbidly curious. I was not disappointed. The speaker was trying to make a point that at the UN it was a Venezuelan position, not a Chavez position. Something of course that even some semi enlightened chavista would disagree with. But pretty much it was in the line of the VP “cipayo” comment. What was particularly interesting was his particular use of obnoxious and meaningless props, including historical examples of long ago as this would justify today’s abuses at the UN. I will spare you the details: they were not even as meaningful as the shifting eye of the guy who was at once trying to hide his anger against the opposition and trying to hide that, well, he was lying and he knew it. That is, just like a small kid that has been caught and is trying to make up some story. It would be amusing except that it was done at tax payer expense. And all of this is not accounted by CNE as pro Chaevz pro electoral proganda, by the way. Long ago I reported that one of the token chavista columnist of El Nacional, Mari Pili Hernandez, was a lousy columnist who spent her time trying to sugar coat as unpalatable a Chavez utterance as she could deal with (here and here). Her “new agesy” approach, while she is only one to two pages away of the substantial Milagros Soccoro, is particularly pathetic when she tries to give advice to the opposition. Frente a esta situación, ¡qué orgullo da ser venezolana! ¡Qué alegría estar viviendo este momento histórico, en el que la patria le pertenece a los venezolanos y no al gobierno de turno de Estados Unidos! ¡Qué orgullo da sentirse dignos herederos de Bolívar! ¡Qué orgullo saber que nuestro país es libre, independiente y soberano! ¡Qué orgullo tener un presidente que no se arrodilla y que tiene como único jefe al pueblo venezolano! 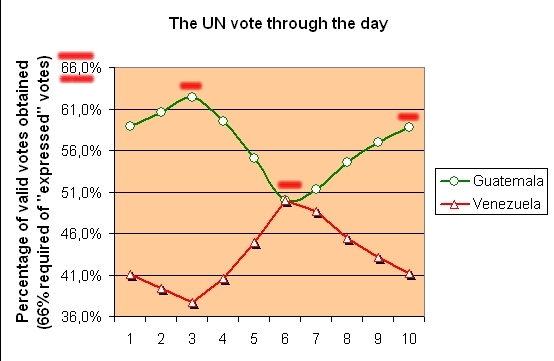 In front of this situation [the miserable 70-80 to 100-110 UNSC vote result], what a pride of being Venezuelan! What a joy of being living such an historical moment, where the fatherland belongs to Venezuelans and not to whomever is in charge in the US! What pride in feeling like a deserving heir of Bolivar! What a pride in knowing that our country is free, independent and sovereign [“soberano” has become a meaning loaded word in Venezuela that defies any real translation]! What pride to have a president who does not kneel and who has as his only boss the people of Venezuela! The easy explanation is of course that Mari Pili does not live in the same country as I do. But that would be too easy and would hide the real importance of these words: the bimbo (sorry, not other word comes to mind to this ardent feminist as Mari Pili seems to be the negation of feminism in spite of her revolutionnary inclinations) that wrote that indecent sycophancy is (was?) the vice foreign minister in charge of North America relations. And with those words she comes dangerously close to support war for Venezuela: the tile of the article is “Rodilla en tierra”, which means knee on ground, ready to shoot. So much for the love campaign of Chavez. Meanwhile for those who worry about what is Chavez foreign policy all about, well, now with such an assistant you know better. 1) There is a link to a rather lousy web page but at the beginning you can download the pic of the host who floats in his left hand the logos of the private media shown above. Apparently he thinks that he really hurts them. Quite telling even before you read a single word of the page. Among the many signs that point out to the governmental debacle in the UNSC seat there is this particular phrase used by the Vice President, Jose Vicente Rangel. He said that the opposition was rejoicing in the defeat of Venezuela, that it was “una oposición cipaya”, a sepoy opposition. I thought that this was worth examining as it reflects so accurately the mentality of the people still behind Chavez. But first a little bit of background. Chavez and Rangel have started using on occasion the term “cipayo” to refer to the opposition as servants of the empire, namely the US. The Spanish word comes through English, a fact already amusing enough in this context, and refers to the Indian soldiers, sepoy, who served in one of the foreign armies that made India a European colony, mostly these Indians who served in the British army. The obvious implication is that any Venezuelan opposition to Chavez is equal to betrayal of the fatherland. We are even worse than mercenaries, since those at least serve in distant lands: we are mercenaries at home. But let’s get beyond such simplistic imagery (which is probably not historically understood by the chavista on foot, by the way) and look at what lays behind. The first thing that we must observe is the rest of Rangel words that suggest that the UN fight for an UNSC seat is hardly much more than some sporting event, and thus we should all root for Venezuela team. Politics becomes thus a sporting event, be it in Venezuela or the UN. Thus we can understand much better some of the actions of Chavez. All his foreign policy is now geared towards getting a maximum effect. It does not matter if people die along the way, if some weirdo with bad hair gets a nuke, what matters is that Chavez is the leader of part of the world. How else could you explain that the dismal figure on the right is considered by chavismo as a great success? "yes, we will not get the UNSC seat but we stopped the US trying to impose Guatemala" some are saying. The US imposing Guatemala? Countries like Spain are imposed on by the US to vote for Guatemala? (as is most of Europe known usually to vote against the US in, say, Iraqi matters). In chavismo mindset the countries voting for Venezuela are the only free countries, free of US influence that is, the new litmus test of freedom. Freedom is not anymore traditional values such as separation of powers, fair elections, democratic respect for minorities, etc… We thus finally realize that Spain never got free from Franco and kept its US enslavement. We are asked to conclude that Venezuela is now the leader of about 70 countries of the world. We do not know exactly which ones those might be (though we can easily guess), but we know that Chavez is heir hero. Apparently the 110 that keep stubbornly voting for Guatemala are just pawns waiting for Chavez to free them. Poor dears, they do not know better. And of course 70 free countries, even if the burqa is de rigueur in some, weigh much more than 110 countries voting against Chavez. As we have all sorts of people pretending to cheer up the government failures, the opposition, embarrassed by “el papelón” is accused of not supporting the team, of betraying the country. And we are threatened with worse if we celebrate that Chavez is exposed as a liar when he announced that he was holding at least 100 UN votes for last Sunday. Should we not worry that our president is such a big liar? And that he spent millions for his lies? But in chavista world Chavez has become the embodiment of the state, a new "L’état c’est moi", and going against him is going against Venezuela. But perhaps Chavez is unto something: part of his appeal to Venezuelans has a certain je ne sais quoi of tribal. We are all in the same boat and we should all support the leader and if we do not support him, no matter what blunder he is making, then we might be jeopardizing the future of the tribe. Tribes suspend the usage of reason, be they in the wild where quick reflexes matter most, or in urban jungles where quick reflexes matter even more. What Rangel reveals is his total abandon of democratic understanding, his new found inability to comprehend that dialogue, even if vigorous, is the essence of democracy and that when whomever in the country that disagrees with you can be treated of “cipayo” then you have license to eliminate them form the public view. This is exactly what chavismo is planning for next year if it stays in office. It is announcing the color more and more clearly as the campaign progresses. Or does anyone wonders about what “one party state”, “unlimited reelection”, “sixth popular power” mean? Oh, and by the way, there was a famous Indian mutiny that could have toppled the British rule in India. One of the names of that mutiny was the Sepoy Mutiny of 1857. Rangel could read a little bit further in history before he chooses his terms. UPDATE: Read the violence that Alek experienced today, as a premonitory introduction of this interview. Today I am publishing an interview of Alek Boyd. For readers of this page Alek Boyd is the Venezuelan activist based in London who has been able single-handedly to expose a few nice tasty misbehaving from chavista agents in the US and London. Thanks to Mr. Boyd, certain agents such as Eva Golinger have never been able to prosper as intended. Not to mention that the intricate network of lobbying and chavista propaganda in the US was in large part exposed thanks to his work which appeared in El Universal and elsewhere such as the Times of London. Now, in a surprising move Alek has decided to follow step by step the Rosales campaign and report it in English to the larger world. As far as I know Alek Boyd is the first blogger allowed to follow live a major Venezuelan campaign (and perhaps elsewhere). You can read it all in Vcrisis. I have contacted him to ask him about his experiences since he is back in Venezuela and thus the interview. All the pictures are his on the trail, I just decided on the legends (and some UK spelling). It has been a surprise for many of us that you have left your activist career in London to come and follow the Rosales campaign. What made you take this decision? First of all I would like to thank you for this opportunity and the interest that my recent activities have aroused. As you rightly mentioned I have been heavily involved in political activism in London for quite some time now, but the impact of a lonely activist is very limited nowadays, especially taking into consideration the person whose behavior I decided to denounce. As you know Europeans never ceased to be extremely racist and certainly having to put up with a third-world-born individual that has zero tolerance for political correctness and other such useless dogmas has made my activism increasingly difficult. I felt that the time was ripe to come back to Venezuela, although temporarily, to prove wrong yet again those I have been denouncing in the past. Apart from that when in London not a day went by without thinking on how to become more effective in my activism and following a presidential candidate around the country certainly qualifies for it allows me to talk directly to people and get a better understanding of what goes on. So it has been a set of circumstances. You had to leave your family behind, which is certainly tough. But you also left a lawsuit. Any news on that? The part of leaving my family behind was indeed very difficult. As you know there are dangers of the physical sort associated with what I am doing and that was the one issue that had both my wife and I worried. Journalist have been killed in Venezuela and although local bloggers do not seem to be in the regime's radar I think my activities abroad have gained me a certain degree of notoriety among officials. One example of that is precisely the lawsuit I filled against London Mayor's Ken Livingstone who saw fit to accuse me of being a terrorist without providing one shred of evidence to support his spurious accusation. Had these allegations come from another apologist of Chavez I wouldn't have paid much attention to it. However in 2005 the Metropolitan Police shot 5 times and killed a Brazilian citizen living in London thought to be a terrorist. Other blunders such as the Forest Gate raid gave me much reason to think, deciding that the best course of action was to sue Livingstone, who, as Mayor of London, meets on a regular basis with Metropolitan Police chiefs. I have no doubts that Livingstone has been following orders from Caracas all along, even more so now that he has become head of Chavez propaganda office in London, headquartered in City Hall, and is about to launch an oil for propaganda programme that his lieutenants will implement in London's bus fleet. I have to admit that I made many mistakes in the way of presenting the case. Not having professional counsel certainly affected my chances of winning. Before even presenting his defense Livingstone offered me a settlement out of court which I decided to accept. However in a surprisingly malicious move Livingstone repeated his accusations the day after I withdrew my claim. I recently wrote a summary of the whole thing which can be read here. I understand that you have been hired to follow the campaign as any other journalist. Could you tell us in what consists the group with whom you go around the country? Indeed my work could be defined as that of any other journalist, although there are certain things that I'm dying to do but can't such as posing questions in press conferences. Unfortunately your regular Venezuelan journalists is rather mediocre in its approach to political coverage. Beyond the daily gossip or the last presidential utterance there's very little understanding about the impact of Chavez's policies both locally and abroad; his alliances with rogue states and propaganda activities around the world are totally unknown for these lot and that's reflected in the intellectual depth of the questions presented to Rosales. I travel around the country with a group of journalist from different media outlets and meet with local journalists whenever we go. However not all is negative. Although the relevance of the questions posed may be a consequence of the rather shallow political debate in the country I have the utmost respect for the journalists and cameramen that I have met thus far most of them have risked their lives in their line of work. Accounts of shootings, beatings, vandalism attacks and robbery make part of their experiences. In spite of that there's a steadfast commitment to keep at it, which I find remarkable and above all admirable. Self censorship is also an issue that doesn't bode well for the flow of information. When there are limited places that one can go work and denouncing things can jeopardize one's livelihood and source of income self-preservation kicks in, hence I'm sure that when all this finishes the world will get to know the true reality of the Chavez era. How do you file your reports? Is it easy to find communication centers wherever you go? The initial idea was to do live blogging but in a country with such a dysfunctional telecommunications network that has proved to be a difficult task. I have had to go to internet cafes and queue for most of the PCs are being used by teenagers playing videogames. Whenever I get the chance to use a laptop with mobile internet access I'm in nirvana but that's seldom the case. What is a typical day on the trail for Alek Boyd? How many places have you been so far? It depends on whether I'm in Caracas or traveling around. To be frank I rather travel, having lived like a nomad for most of my life this is the aspect I enjoy the most. In Caracas wake up at around 6am, jump in the tube, head to the campaign's communication's office to sit in different meetings, discuss strategies, cover local press conferences, etc. When traveling get up at 6am, jump on a plane and go to different cities around Venezuela. Invariably rallies and other such events tend to start at around mid day, which gives me time to talk a lot to local people and learn about their issues. It's in these times that I have gathered a wealth of information about how Chavez is perceived outside Caracas. There's a lot of traveling involved. Rosales has visited up to six different cities in a given day, only to continue the following day with more rallies in cities of other states. To someone who lives and breathes politics, like me, this is the experience of a lifetime. Walking with the candidate could be considered a physically challenging extreme sport for a lot of people feel the need to touch, hug, kiss or talk to him when he passes by. As number of people increase it's very difficult to get near him. In any case I thoroughly enjoyed what I'm doing. I have been in barrios and cities in Caracas, Miranda, Guarico, Zulia, Yaracuy, Anzoategui, Monagas, Bolivar, Merida, Cojedes, Barinas, Aragua, Carabobo, Trujillo and Nueva Esparta, that is 15 states out Venezuela's 24. Have you had the chance to speak with Rosales for more than an "hello-goodbye" moment? Unfortunately no. I continue to be perceived as a stranger, as someone who does not belong here. The role of bloggers is yet to be understood in this country in its full dimension. Could you tell us an anecdote or two? Do you have pictures you could share with us? So you have been exposed to the Venezuelan division when chavista supporters come as hecklers to Rosales meeting. Is this an increasing phenomenon or do you think they are more tolerant to Rosales campaign? In Maracay I noticed that the hecklers that attacked the Rosales march in Plaza Girardot were the same that block our way to barrio San Vicente further along the way. In Antimano I noticed that the same man that was instigating violence against us was in three different parts, again along the way. In Valera local residents told me that the 'chavistas' blocking our way didn't even live there. 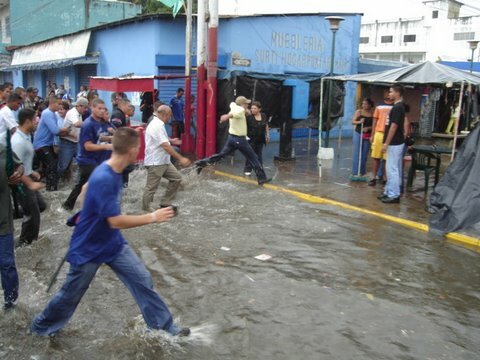 These are Chavez's thuggish quick action groups that seek to terrorise. However thus far they have failed miserably mainly due to the number of people that keep showing up at Rosales' rallies. When they feel safe and no one's around they reengage in their tactics, as seen in Valera when they attacked the Globovision crew. Do you really, really get into chavista strongholds? Well Antimano, Carapita, Caricuao and Petare in Caracas are considered Chavez's terroritory. So is Cantarana, barrio El Milagro in Valera, Barrio San Vincente and Sector Sorocaima in Maracay, cities in Anzoategui and Monagas, in sum these are appreciations of people in the know. As I have been living in London for nearly 7 years I can't tell whether this is true or not. Given the number of people who spontaneously keep showing up, to me all is Rosales' territory. What do you think is the people's response to Rosales campaign? Do you sense that he is making inroads within chavismo? People are showing up in increasingly large numbers at his rallies. Although the world took notice after last Saturday's Avalanche in Caracas, smaller avalanches had been taking place in the provincial cities around the country. One hears people saying "the last time I saw such a large crowd in a political event was before CAP won the first presidency." That tells a lot about people's response to his campaign. He keeps repeating a couple of mantras that I consider extremely valuable. Firstly he says that beneficiaries of misiones should be at ease for he will not prosecute anybody nor will he finish the misiones. As you know Chavez's only real success thus far has been the misiones and he plays the fear factor among his constituents assuring that if he's not around they'll lose all benefits. 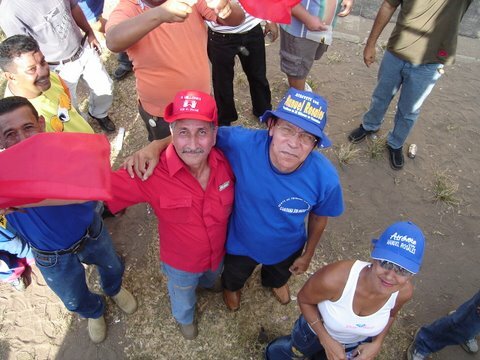 However in Zulia state people do not have to don red t-shirts to get access to social projects implemented by Rosales, ergo he aims at devolving dignity to the disenfranchised that do not particularly fancy to be played like political cannon fodder. The second has to do with civil servants. Chavez has degraded them to the point of compulsory assistance to political events, so pena of being dismissed should they fail to show up, or forcing them to wear red t-shirt to go to work certain days of the week. It's hard to tell whether or not this is being well received by chavismo. Well placed sources within chavismo have told me that Chavez popularity among public employees is wearing thin. Besides one can't forget that the vast majority of civil servants in this country are either adecos or copeyanos. Rosales has pledged that no public employee will be dismissed on political grounds but rather due to corruption and other unlawful practices. It's therefore safe to assume that only a handful of them have got something to fear about. In my opinion another masterstroke of Rosales is to have extended this discourse to the armed forces and Cubans working for Barrio Adentro. To the latter he has promised help to bring their families kept in captivity in Cuba. The result of these approaches will be seen on 3 December. So Mi Negra is a hit. Can you point out to other hits? The security plan, the health plan, the tourism plan, the project of distributing 50% of the royalties generated by the coal industry in Zulia state to its rightful owners, i.e. indigenous groups such as Wayu, Bari and Yupkas, the promise to transfer permanently land ownership to campesinos, agreements with President Uribe to safeguard our common border... Sadly for the reasons mentioned above the media has failed to inform the public about these issues but these plans if successfully implemented can have a positive impact in the short, mid and long term for the life of all Venezuelans. Finally about yourself. Since you have been listening to Rosales speech all the time, making exceptions for all that are routine electoral promises that any politico makes on the trail, what is your perception as Rosales will and ability to at least try to fulfill some of his promises? Well the man is a rarity to be frank. One thing that surprises me is his constant reference to "la palabra empeñada" As you know that's a practice that only honorable people consider worth keeping. In this week's visit to Zulia a waiter at the hotel where we were staying said to me that Rosales had devolved the dignity to the Zulianos. Now that was a bit of a shock to me, given the regional pride that has always characterized them. But this chap said that attitudes were changing in Zulia, that now Zulianos, though still very proud about their land and culture, are starting to behave differently in the civil sense. He said that they now think twice before dumping rubbish on the streets or disrespecting rules and regulations just for the sake of it. Still, a farmer willing to get onto the platform from where Rosales was addressing the crowd in Villa del Rosario smashed one of his bodyguards' face when he was denied access -talk about respect for norms, but all seem to believe that whenever the man promises something he always delivers. Almost every person I asked in Maracaibo, Villa del Rosario, Machiques and Ciudad Ojeda told me that he is yet to fail on his promises. He has a track record that speaks volumes about fulfilling electoral promises having being in Zulia politics for 27 years. If he cares for Venezuela as much as he does for Zulia I reckon there's a pretty good chance that this country leap frogs towards a brilliant future. He seems to act in commonsensical fashion, which again is not something one would expect from a politician that has built a career out of the gutter. What I do like about his approach is the fact that he won't become a puppet of Caracas' elites which means that decentralization will be one of the fundamentals of his administration. As the majority in this country he is a firm believer of upholding rights to private property, freedom of expression and association and the business of "la palabra empeñada" can only mean that he gives special significance to contracts and agreements. Lastly how do you see your future when all this finishes? Well, as I said to someone the other day, I sincerely hope that Rosales wins the election so that the possibility of returning permanently to my homeland becomes feasible. There's much to be done in this country and I am keen on participating actively in its reconstruction. Thank you very much for your time, and for making history for Venezuelan bloggers. The first thing about the momentous events of today is to keep a sense of perspective: a 2 year stint in the UN Security Council is not a big deal. It does not even give much prestige: after all Venezuela has been in it 4 times already and it seems that this has not helped much today. 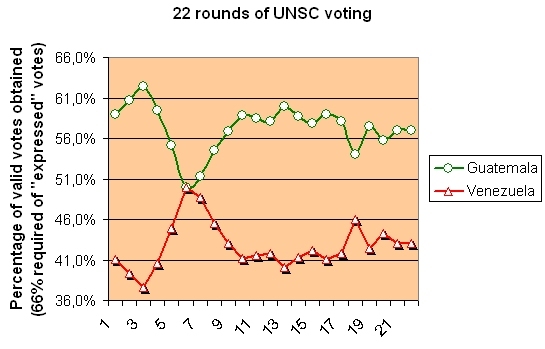 The reason why there is Security Council, S.C., is that every time there is a crisis you cannot have the near 200 members seat down immediately and debate. Many parliaments in the world know how cumbersome it is to get all their members to seat in a hurry. In the UN it is potentially so difficult (some ambassadors might be half a planet away) that wisely they came up with the S.C. as a mini parliament of sorts (for new comers: there was no internet in 1945, and often no telephone even, or a cranky one at best). Wisely the 10 open seats (5 are permanent) are sort of distributed regionally. 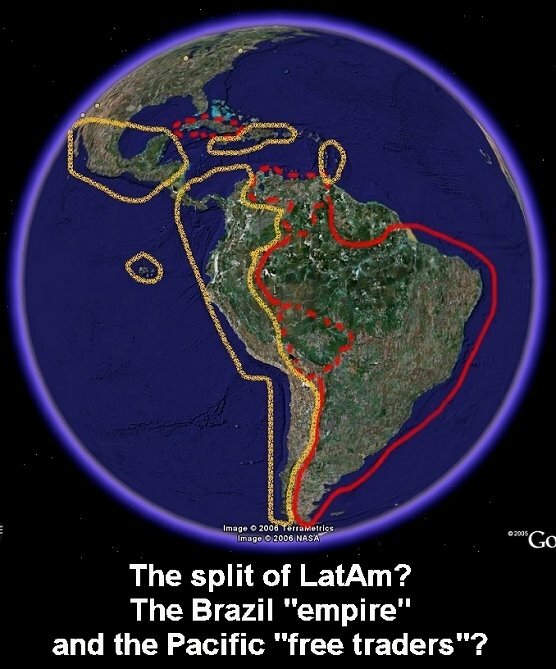 Thus Latin America gets two seats in general, one for the Caribbean and Central America and another one for South America. But this is not a strict rule as for example right now Peru and Argentina hold a seat. Finally the countries chosen for the S.C. tend to be countries that show a capacity to cooperate, for some dialogue, to participate in the burdens of the UN such as sending troops for peace keeping or giving money for their support, at least according to their capacity. A last but not least observation is that when everything is said and done, any country can seat there depending on how international power games play out. Thus democracy or Human Rights respects are no guarantee to get in ANY of the UN agencies as we see regularly major violators of Human Rights such as Cuba seat in important committees on Human Rights. That is, countries will end up voting on their own circumstantial interests for whomever they feel like at any given time. For at least 150 countries in the world it is of absolute no concern whether Venezuela or Guatemala get this year open seat. Oh, they do have a preference but they are probably neither going to express it in public nor make any fuss if their preference loses. Two years ago Guatemala decided to try a bid for a seat. After having managed to end a bloody civil war and effect a return to civility it seemed a good idea to mark the return to civilization of Guatemala. Soon enough most of Central America rallied and Guatemala initiated its protocol campaign which consists in making sure that as many countries as possible know about Guatemala, its good intentions and that it will be able to speak on the name of its regional area. That is Guatemala is supposed to “report” in a way to every country South of the Rio Grande, including the Caribbean. Thus if there is a conflict, say for the sake of the argument, between Brazil and Costa Rica, it could be Guatemala that could present it to the security council and help each country present its case when appropriate. But Chavez decided about a year ago that he wanted that seat for no other reason but to attack the US (using Bush as an excuse). 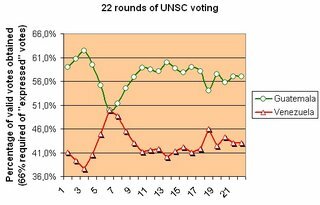 The amazing thing is that today he almost made it: at some point 93 countries voted for Venezuela knowing full well that since last Chavez visit to the UN, a Venezuelan presence in the Security Council would be a perturbing presence considering all the major issues at stake for the next two years. A president by the way who has expressed open support for terror groups or regimes (North Korea, Hezbolla, Syria, Iran). All the countries know that, and if they vote for Venezuela that reflects in large part how little real influence the UN has and how little it cares about regaining some of this prestige. Not only it voted anti US, but it failed to do so properly. 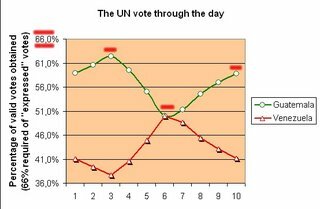 The little graph above shows how the vote moved through the day (according to Globovision reports). To be elected either country was required to get 66% of expressed votes. It is not idle to note that the other 4 seats were allotted ON THE FIRST ROUND VOTE. I have presented the result as percentage of the votes obtained. What happened? First Guatemala had been campaigning for long enough whereas Chavez was a late comer who tied to buy his way in. For this he offered all sorts of projects to all sorts of countries and even opened more than a dozen of embassies in countries where Venezuela has no business whatsoever. But some small countries love to have a useless embassy as it creates clerical and janitorial jobs, plus it is an occasion for a few parties in the tropical boredom that envelops them. Since Guatemala had secured enough votes it got its due and even climbed to a maximum of 116 votes, 62.4%. At this point, if Venezuela were a civilized country, it would have recognized that having served 4 times in the Council it would be a gracious thing to decline in favor of Guatemala saying that they will run for next year seat instead. Actually, if Chavez were truly civilized he would have done that after the first round. But no, Chavez is a military and such subtleties are lost on his “you or me” world. And Venezuela stayed. The reason is that after a few rounds of voting countries bound to Guatemala are released of any vows they might have towards Guatemala. For example during the “campaign” Panama might have said Guatemala “OK, I´ll vote for you 4 times in a row but if problems persist then I will do as I think it is best”. Guatemala began to slide. This could also be due to some countries trying to offer an elegant way for Venezuela to exit by allowing it to improve its result. Thus we got the second climax when Guatemala and Venezuela tied at 50% each with 93 votes. Venezuela (or rather Chavez, let’s not forget that it is not Venezuela’s foreign policy, but strictly a Chavez one) decided to keep on, bringing the situation to an embarrassing 10 round vote while slowly but Surely Guatemala regained its lost ground. It is difficult to observe how mishandled was the whole thing by the Venezuelan staff sent for the occasion. But I suppose that no one dared to tell the truth to Chavez as surely a few heads would roll after such a humiliation for the new world leader the Chavez fancies himself to be. The only charitable explanation here is that Venezuela wants to at least be able to say that it forced Guatemala out and that since Guatemala was the voice of the US/Bush, it would be a great victory for Venezuela even as it lost. I suppose that naïve or ignorant souls could buy such an argument. Meanwhile it looks now that neither Venezuela nor Guatemala will make it and Chavez will get at least that fig leaf, but at the cost of having permanently alienated Guatemala and many of its Central American supporters who cannot possibly see with a good eye the Venezuelan bully trample on something they had been working together for so long. Because the fact is that it is a huge diplomatic defeat for Venezuela. The first vote, the 109-76 is the important one and it reflects the contempt of the majority of the world for the military lout that made it president: they got the measure of the man a few weeks ago with his devil speech, an unseen tantrum since the time of Khrushchev. The 76 countries who voted for Chavez are mostly made of a group of little to no democratic countries from Africa and the Middle East plus a few LAtAm that had to cast their vote for Venezuela for automatic solidarity such as Uruguay voting for Venezuela "because it is in Mercosur". Apparently experts tonight say that a significant amount of Islamic countries knew better than to support an Hezbolla/Iran supporter. The “campaign” for the UN seat has cost Venezuela hundredS of millions (and I underline the plural in hundreds) and it will not bring any return (nor it would be bringing justifying returns if Chavez had got the seat). In a normal country there would be accounting for the financial and diplomatic damage that such reckless foreign policy causes. We might pass the bill on December 3. Meanwhile it will take years for Venezuela to recover some of the international stature it used to hold. PS2: A few weeks ago one of my post showing homeless in Venezuela was controversial. But I observe today that Alek Boyd following the Rosales campaign can find even worse pictures than what I posted. And that in La Vega where a semi fascistic crowd tried to bloc a Rosales campaign event. Some democracy! And all of this happened yesterday while Chavez was being set straight at the UN. Maybe this picture will reach the hands of a few countries who are still supporting Chavez.